Write for Illustrated Brochure with all information on Stocks and how to order! on the trap range, which brought him the Hi-Trap trophy, and wound up with a total score of 332 x 350, which also gave him the First Prize of the shoot. Art Jackson's 186 x 200 on the rifle targets secured the Hi-Rifle trophy, along with first place awards for 50 x 50 scores on the standing deer and the standing boar. First on the running boar was Captain James Vann, dropping only two points in the five shots. Captain Vann also took second in the High-Aggregate scoring, and second in the trap shoot. Mrs. Jaclcson in relaxed, solid sitting pose levels .222 Remington at the fox. 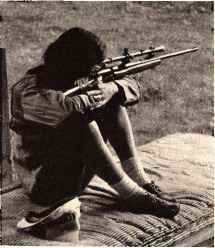 from which the Rod & Gun Clubs purchase their sporting goods. First prizes were beautiful silvered plaques with hunting scenes. 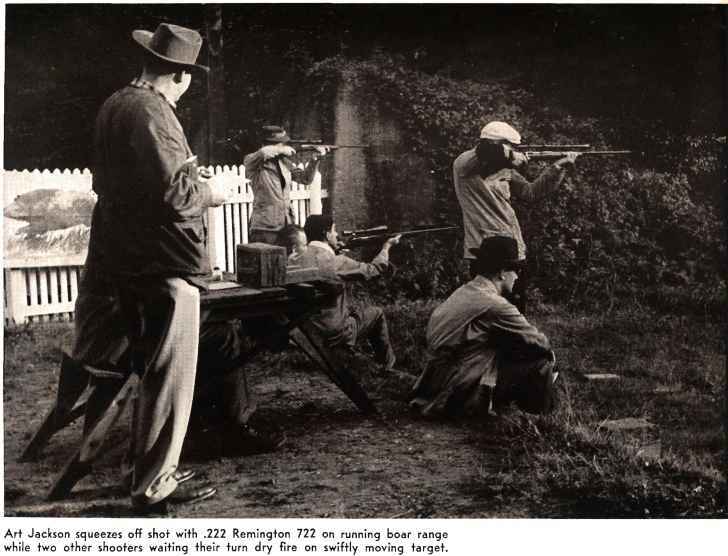 The first Hi-Aggregate prize showed members of a hunting club training on their target range in a richly detailed relief complete with black wooden frame and silver nameplate. Other winners walked away with several boxes of handloading components, and of special interest was the so-called "wurst" prize, a pair of excellent binoculars, for the shooter who fired the day's lowest score. The prize-awarding ceremony is held in the club-house. By the time it is finished, a couple of snap-shots taken for the club files, and the always interesting discussion of scopes, rifles and suitable loads for the next shoot is over, it's time to drive home for dinner, another nice day on the range has come to an end. Speaking of dinner, being a guest during one of these shoots, you will most probably be invited to one of your friends' homes for a meal, and he will proudly show you his row of hunting trophies on the wall. Don't be surprised, then, if he points to a beautiful pair of "Rehbock" antlers, saying: "And this one is my wife's trophy—best of them all. She shot it from the Hochsitz this year, and even mounted it herself." This is the spirit of the American Rod & Gun Clubs in Europe!